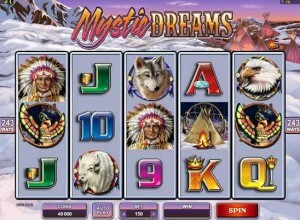 All Slots Casino :: NEW Video Slot - MYSTIC DREAMS :: PLAY NOW! It’s winter in the majestically beautiful ancestral lands of the native American tribes, a wide spectacle captured by the sharp graphics carrying the theme of All Slots Casino’s newest online video slot, titled MYSTIC DREAMS. This is a 5 reel, 243 Ways-to-Win game with Scatters, Free Spins, Wilds and some serious Multipliers on the right combinations. The tribe’s mystical Totem Pole offers the gateway to wins when 3, 4 or 5 appear adjacent to one another, launching 10, 15 or 20 Free Spins that can re-trigger. During those Free Spins if the Teepee Scatter symbols appear on reels 2, 3 or 4 it adds, respectively, Multipliers of 2x, 3x and 4x….but it doesn’t end there; if multiple Wilds have built the winning combination, the player reaps an extraordinary 24x reward! The graphics carrying the theme in Mystric Dreams merit special attention, calling to mind wolves, dignified chiefs, dream catchers, and the great bison and eagle wild life of the old plains and mountains…and in this game day changes dramatically to a crisp, starlit winter night when the generous Free Spins feature is triggered. The combination of Free Spins and big Multipliers in this game gives the player great opportunities for success as well as entertainment, so take a time travel trip back to the days of the original Americans and try out Mystic Dreams – at All Slots Casino.